This is a very delicious dish. One of the great things about it is that you can make it diabetes friendly by using sugar free marmalade. While making the pasta I used the entire bag of edamame because we did not have use for half a frozen bag of them. However, I do not suggest you do this because there were too many. Also, make sure the pork is fully cooked through. It will most likely take longer than the recipe says to cook. Bring a large pot of salted water to a boil for pasta, and cook pasta to al dente. While pasta cooks, heat 2 tablespoons oil in a large skillet over medium-high heat. Season chops with salt and pepper and cook 6 minutes on the first side, 4 to 5 on the second. Remove chops to a plate and reserve, cover with foil. Add 3 tablespoons orange marmalade, a couple tablespoons teriyaki sauce and a 1/4 cup of water to the pan, bring the sauce to a bubble and combine 1 minute, stir in sesame oil remove from heat. While the chop cooks, heat a second skillet with 3 tablespoons oil over medium high heat. Stir-fry the scallions and edamame a couple of minutes. Drain pasta and toss with scallions and edamame and remaining teriyaki sauce, about 1/4 cup. Sprinkle noodles with sesame seeds, if desired. 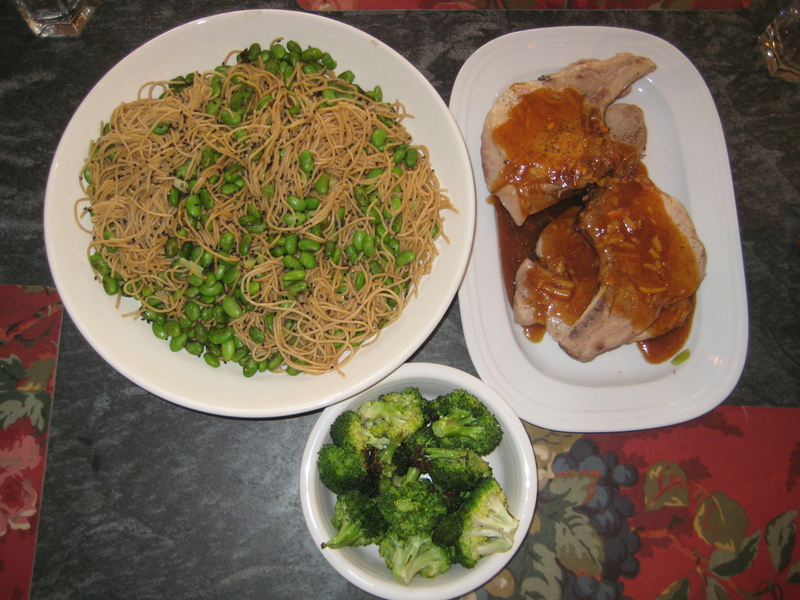 Slice pork or leave chop whole and top with orange-sesame glaze. Serve teriyaki noodles alongside.